Implementing Chapter 3 of Water for Victoria; progress to September 2018. 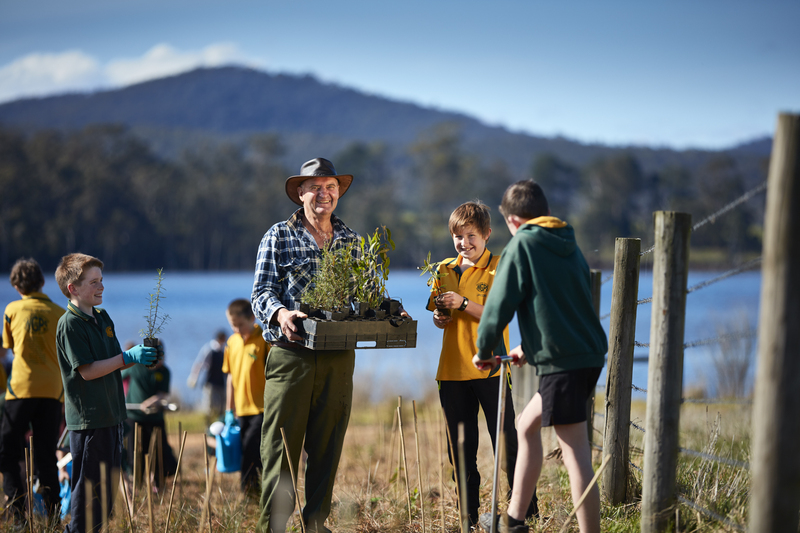 The Victorian Government is protecting the rivers and landscapes that people love and use by involving groups across the state in flagship projects to restore waterway health, improve the environment and support agriculture and recreation. Land and water managers, local communities and Traditional Owners are bringing their knowledge and experience to improve care for waterways and Country. Strengthened partnerships are supporting collaboration across our catchments. We are investing in activities to restore and enhance our waterways and to water our environment, so that Victorians can enjoy and share the benefits of their local waterways and catchments now and into the future. The government has supported community involvement in citizen science through the WaterWatch and EstuaryWatch programs, and has continued to ramp up the River Detectives program in schools across the state. Photo: Steavenson River Tree Planting Day - Angler Riparian Partnerships program. Courtesy: John Douglas VFA. Completed 10 new Catchment Partnerships Agreements that outline how regional partners will work better together for regional communities with a total of 135 signatory partners and an additional 87 non-signatory partners. Glenelg Estuary and Discovery Bay is named as Australia’s newest Ramsar site in 2018. This year's annual catchments summit focused on strengthening partnerships and provided over 200 delegates from across the catchment and water sector the opportunity to showcase projects, discuss new ideas and share knowledge. Healthy riparian land – the land beside rivers and wetlands — is critical for healthy waterways. The Regional Riparian Action Plan is a five-year plan (2015- 2020) to accelerate works to improve the health of riparian land along Victoria's regional rivers, estuaries and wetlands. Works include fencing to manage stock, revegetation programs, weed management and construction of off-stream watering systems. In its third year of implementation, the plan is accelerating and producing great on-ground benefits. Catchment management authorities have been working with over 760 landholders, Landcare groups and other partners. Over 1500 kilometres of waterways and over 26000 hectares of riparian land (61% and 92% respectively of the 5-year action plan targets) have been protected or improved since the plan began in 2015. Victorians are passionate about their rivers and wetlands — 95 per cent of us use them for activities like camping, birdwatching, swimming, boating and fishing. 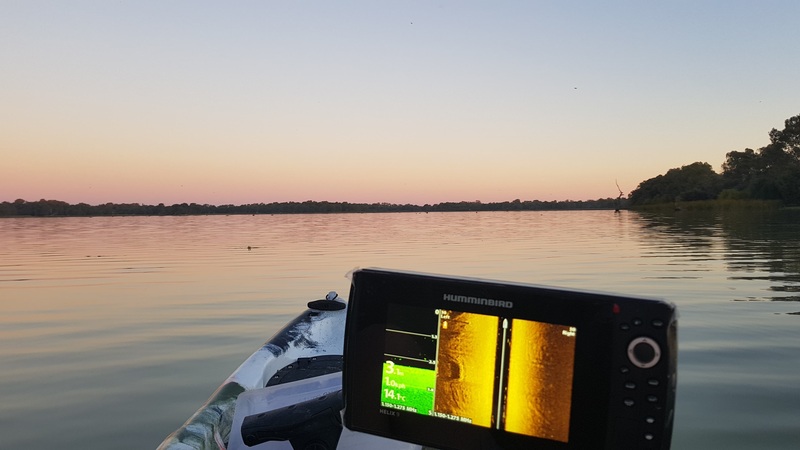 Studies show that environmental watering is producing outstanding results in places like the Goulburn and Campaspe Rivers, where for the first time in 10 years Silver Perch has returned. The fish were found to undertake long-distance migration in response to increased environmental flows, with a total of 9800 of the species recorded moving through the Torrumbarry fishway over the last two years. 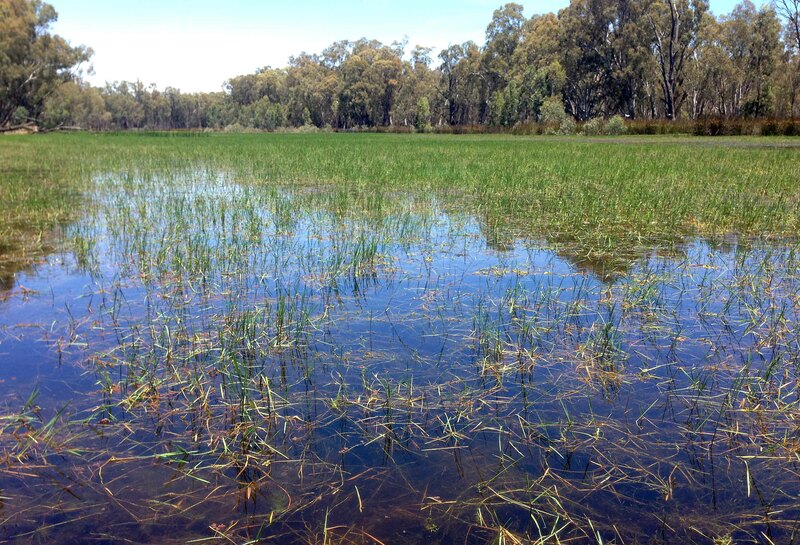 At Hattah Lakes, increased flows have resulted in a tremendous increase in small-bodied native fish. In 2012-13, monitoring recorded a total of 381 fish across five species. By 2016-17 the number had increased to 41,550 fish across six species. These included the threatened Murray Rainbowfish and Unspecked Hardyhead. In 2017-18, the Victorian Environmental Water Holder watered all of the state’s nineteen systems that are able to receive environmental water, benefitting ecosystems in 43 rivers and creeks and 85 wetlands. Photo: Gunbower Forest before and after environmental watering. Courtesy NCCMA. We are in an ongoing relationship to work towards getting our river frontage fully fenced... There are many benefits to be enjoyed, from both a productive and environmental perspective. We are pleased with the work we have done on our property. It will benefit generations to come. Les Pearce, Recipient of riparian incentive grant from North East CMA. The Dandenong Creek corridor runs through a dense urban landscape and provides a vital haven and biolink for native flora and fauna, as well as for the region’s human inhabitants. Work is needed to strengthen some environmentally significant sections of natural bushland. The $1 million, Transforming the Dandenong Creek corridor into a world-class urban Living Link project will transform 22 kilometres of the creek between Bayswater North and Dandenong. The Port Phillip and Westernport Catchment Management Authority, Melbourne Water, Parks Victoria and five local councils are working together on the project. Environmental works are being carried out across 38 priority sites, and working bees, citizen science monitoring activities and educational events are increasing public use and appreciation of the corridor. The project is being delivered through the Living Links program. In 2017-18 it completed 18 hectares of revegetation, 23.7 hectares of weed control and engaged and educated close to 600 local residents. Photo: Living Links community event at Dandenong Creek. Courtesy Port Philip and Westernport CMA.